From our hotel in Erbil we drove up winding, sloping mountain roads with hairpin turns to a popular destination called Beykhal Falls close to the town of Soran. The resort village is built around a small water spring where a narrow stream crashes down from the surrounding mountain. 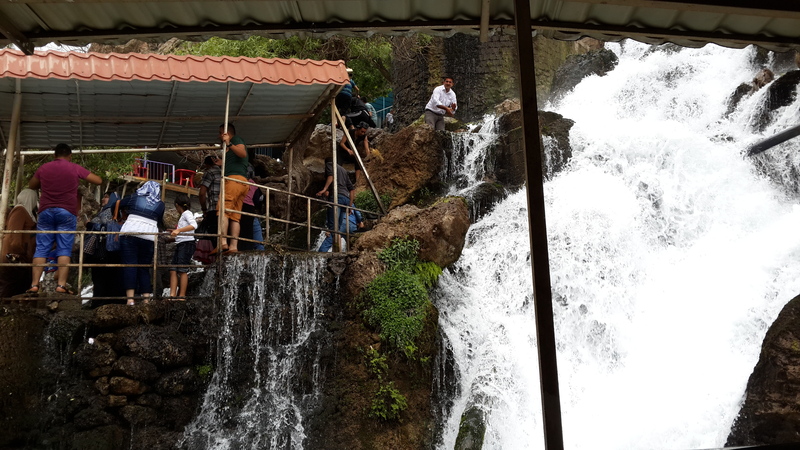 There are many pop-up shops, restaurants and picnic areas around Beykhal Falls (it’s not really a waterfall) and the locals are friendly and welcoming. Here you can also find houses and apartments for rent and I thought to myself how great it would be to take a room for a while and spend the time hiking and exploring the terrain. A short distance away and yet much higher up, we found ourselves climbing up to Mount Korek. We disembarked for a look and from this vantage point I was left breathless as my eyes went over a cliff with a gorge between the mountains in the distance and a clear blue stream below. Continuing our journey, the road finally ended at a resort area where we rode up an aerial cable car – the teleferic – to an elevation of about 1,700m and took in yet more stunning views of the beautiful, rugged mountains. On the way back to Erbil we stopped by the small economic town of Shaqlawa where you can buy authentic mountain honey (for about $40-60 per jar), the freshest pistachios, cashews, and other nuts, and a host of other local sweets and preserves. We spent around $250 at one such shop buying sweets, honey, and mixed nuts by the kilos. Erbil itself is also a beautiful city. At the very center of Erbil and perched on a hill sits the Citadel of Erbil, one of the oldest continuously inhabited places in the world. Artefacts have been found that date back at least 8,000 years, with archaeological sites still being excavated. The more you dig the further back in time you go. The Citadel itself is undergoing a major restoration project at this time so unfortunately we were limited in what we could see inside. I would estimate the size of the citadel at around five city blocks, or the size of a small village.